Dori is the founder and CEO of InSPAration Management, a firm specializing in spa and salon business development, advanced education, and BizTools. Over the past 18 years, Dori has contributed to the success of spa companies worldwide. Dori’s passion is developing innovative, effective, educational programs and business strategies that lead to exponential growth and profits! Her Success Library and Leadership Seminars and programs are delivered in a clear and concise manner, providing spa and salon leaders with implementation blueprints to ensure success. She is the recipient of the American Spa Preferred Educator Award and is a sought after global speaker within the spa and wellness industry. Dori is a published author. 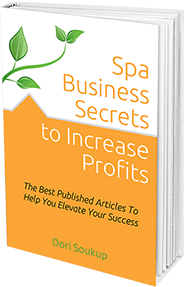 Her articles and insights are featured in national and international trade publications, and you can find her book on Spa Profits on Amazon. Complete the form below to receive the download in your inbox!